This is one of my very favorite recipes. 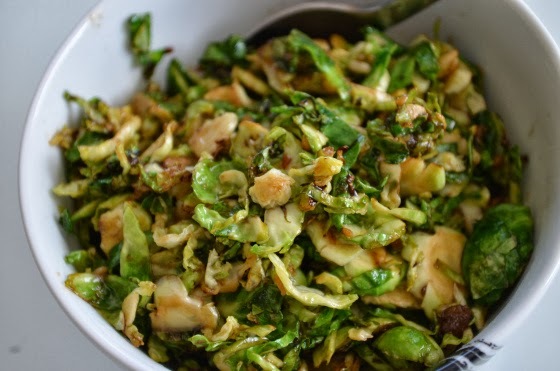 ‘Tis the season for caramelized everything and Brussels Sprouts are no exception. Especially when they can be threaded into pretty ribbon like wisps! Mmmmm…these will make any Brussels Sprouts hater love them. Enjoy! 1) Slice each Brussels Sprout very thing until you have a mound of feathery Brussels Sprouts ribbons. 2) Heat the olive oil over medium high in a large skillet and saute the garlic for 30 seconds. 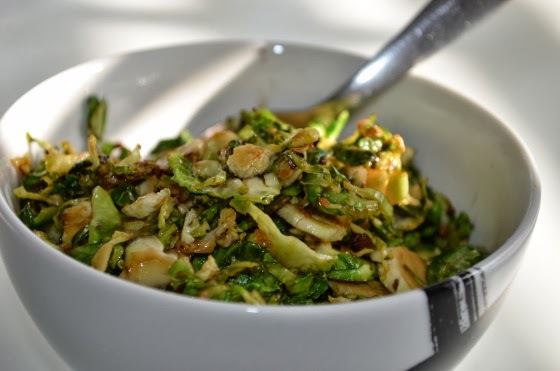 3) Add the Brussels Sprouts and continue sauteing for another 4-5 minutes, until bright green and tender. 4) Add the sea salt and brown sugar and toss together. 5) You can also finish by adding toasted nuts for more flavoring. I made these for lunch today and added caramelized onions and a few pieces of left over yellow squash. My children loved it! Thanks for the recipe! I'm so glad you liked them! What a great idea to add onions and squash…I'll have to try it next time!